See Completing the Square for a discussion of the process. Creating a perfect square trinomial on the left side of a quadratic equation, with a constant (number) on the right, is the basis of a method called completing the square. (The leading coefficient is one.) Get the x-related terms on the left side. Keep the constant term on the right side. Prepare the equation to receive the added value (boxes). Take half of the x-term's coefficient and square it. Add this value to both sides (fill the boxes). Combine terms on the right. Factor the perfect square trinomial on the left side. Take the square root of both sides. Be sure to consider "plus and minus", as we need two answers. Solve for x. Clearly indicate your answers. Prepare a check of the answers. Finding the x-intercepts requires setting y = 0 and solving for the x-values. This question is really asking you to solve 4x2 - 8x - 32 = 0. The leading coefficient is NOT 1. Divide all terms by 4 (the leading coefficient). Move the constant to the right hand side. Take half of the x-term's coefficient and square it. Add this value to both sides (fill the boxes). Combine like terms. Take the square root of both sides. Be sure to consider "plus and minus". Get the x-related terms on the same side (move 4x). The leading coefficient is 1. Notice that this example involves the imaginary "i", and has complex roots of the form a + bi. Read more about imaginary values. These answers are not "real number" solutions. They do not have a place on the x-axis. (The leading coefficient is one.) Move the constant to the right hand side. Get a common denominator on the right. Factor the perfect square trinomial on the left side. Combine terms on the right. At this point, you have a squared value on the left, equal to a negative number. We know that it is not possible for a "real" number to be squared and equal a negative number. This problem involves "imaginary" numbers. If you have worked with negative values under a radical, continue. Take the square root of both sides. Be sure to consider "plus and minus". Notice the negative under the radical. 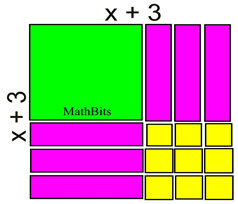 Starting with x2 + 6x - 16 = 0, we rearrange x2 + 6x = 16 and attempt to complete the square on the left-hand side. 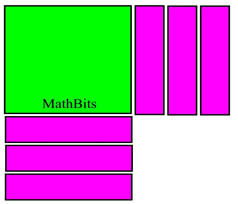 KEY: See more about Algebra Tiles. 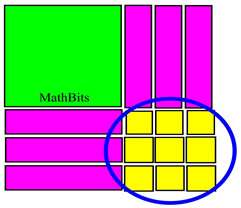 Arrange the x2-tile and 6x-tiles to start forming a square. Notice how many 1-tiles are needed to complete the square. Read the sides of the completed square.